The loop around the quiet, remote Two Ocean Lake travels through open meadows and cool forests. From the parking lot, follow the trail down to the shore of the lake and cross over the bridge at the outlet. 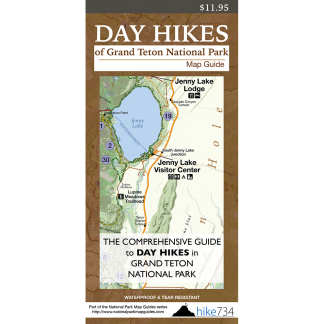 The trail follows along the north shore, alternating between open meadows and forests of aspen, fir, and pine. 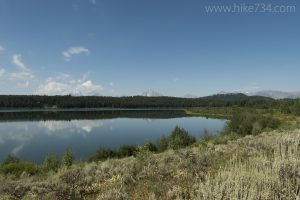 The forests provide shade while the meadows provide wonderful flowers and views of the lake backdropped by the Tetons. To complete the loop around the lake, stay left past the junction, and continue on what is now the South Shore Two Ocean Lake Trail. You enter a pleasant, wet forest along a shaded ridge. A few switchbacks up the ridge provide the only real elevation gain. Traverse for a bit, then descend, passing through a couple of intermittent meadows during an otherwise wooded walk back to your car. Trailhead: Approximately 1.2mi/1.9km north of Moran Junction on Hwy 287, turn north onto Pacific Creek Road. After 2.1mi/3.4km turn onto the dirt road heading north towards Two Ocean Lake. The trailhead is at the end of the road.